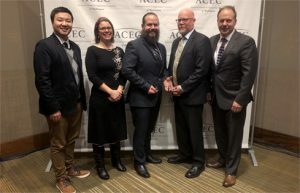 The Washington American Council of Engineering Companies (ACEC) has once again recognized GeoEngineers’ work during the chapter’s annual 2019 Engineering Excellence Awards. Three projects received awards Friday night at the award gala in Bellevue, Washington. This is the thirteenth consecutive year GeoEngineers has won awards from ACEC Washington. ACEC Washington gave a Gold Best in State Award for technical complexity to our Seismic Upgrades project at the Naval Medical Center in San Diego, California. Reid Middleton, Inc. led the project team, but King Chin, Yanbei Zhang and Shaun Stauffer contributed significant geotechnical expertise to the complex seismic analysis. Left to right: Roger Chang, Tricia DeOme and Morgan McArthur with David Nelson (SiteWorkshop) and Chris Heger (OAC Services) from the Pt. Defiance team. Two high-profile Puget Sound projects also won Silver Best in State Awards. The Point Defiance Phase I project in Tacoma, Washington (Morgan McArthur, Tricia DeOme) won for successful fulfillment of client/owner needs, and the Hoa Mai Gardens & The Hillclimb at Yesler Terrace project in Seattle, Washington (Bob Metcalfe, Braydan DuRee) won for the project’s unique or innovative application of technology. Staff from both projects were on hand Friday night to receive these prestigious awards. 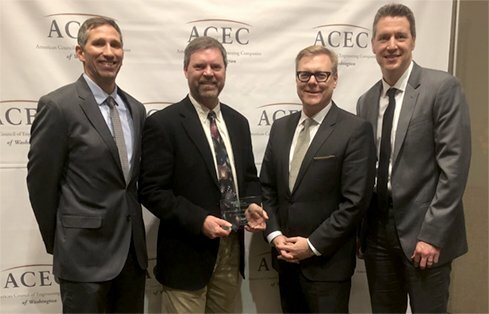 The ACEC Engineering Excellence Awards are widely respected within the industry, and GeoEngineers’ long string of wins is evidence of the consistent quality of the firm’s work. Read about our work for more on these and other innovative GeoEngineers projects. Left to right: Mark Davies (MIG/SvR), Bob Metcalfe, Jeff Foster (GGLO) and Andrew Ayling (CPL) from the Hoa Mai Gardens & The Hillclimb team.